Looks like I'm holding pretty steady! Can't complain about that!! And I've started back with my vest. I'm using the beast as I type these very words. Good thing I'm not writing, or you wouldn't be able to read it. I don't feel like I coughed any extra after starting back, but it's only a couple days in. What else? I think that's about it. Nothing going on. Just getting back into the normal routine of life. Hopefully by this time next week, I'll have window treatments!! PLEASE let that be the case. I'm tired of living in a fish bowl. And because I can't resist, here's a picture of the pups! 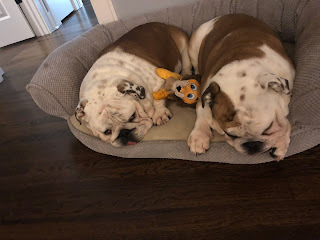 After chewing and fighting over the stuffed lion, they decided to take a nap with him. Goofy things! I took them for a walk yesterday too since the weather warmed up to the 60s! I'm ready for the cold though - I like to bundle up and sit by the fire!